St. Petersburg is often referred to as the Russian Federation's second city after Moscow. Known as Leningrad from 1924-1991, the city was founded by Peter the Great in 1703 as Russia’s ‘Window on Europe’. It has been built up over the years with many fine buildings such as the Hermitage and the Church on Spilled Blood, and was the birthplace of the Russian Revolution in 1917 led by Vladimir Lenin – starting more than 70 years of Soviet rule. With the city and the vast suburbs as a backdrop the independent transport videos cameras present a view of the trams and trolleybuses of this large city. Our filming starts in the grand thoroughfare of Nevskiy Prospekt, where we see trolleybuses in action. They are mainly of Transalpha and Trolza manufacture, which are built in Russia. A visit to PloshchadLeninya shows both trams and trolleybuses running together, quite a site, with a mass of overhead wiring! We then ride on tram 3908 to Alexandrovskiy and on to Vasileostrovskaya, where we see many movements outside the tram depot, then a ride on tram 3312 takes us to Finylandski Station. More filming takes place at Ligovskiy Prospekt, Kupchino and back at Nevskiy Prospekt. 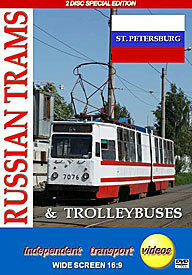 A trolleybus ride is taken on 3316 to Novochevkasskaya and then a tram ride on car 7103 to Ladozhskiy. Other filming locations include Prospekt Kosygina, Nastavnikov with a further tram ride to Ladozhskiy on board tram 7084. You will see that there has been little investment in the trams and tramway infrastructure since the fall of Communism. However, there are some new low floor trams appearing and move to more investment is on the way, as not so many years ago St. Petersburg had the world’s largest tramway. Most of the older trams are locally built – often in the undertaking’s workshops, but newer trams are built in Ust Katav. Tram numbering includes the depot prefix number as the first number. There is also some new investment with the trolleybus fleet – look out for the new articulated vehicle on Nevskiy Prospekt on one of visits to the location at the end of disc one. We conclude with a montage of Metro trains operating in the grand stations of the system built by the Communists that opened in 1955. We hope you enjoy your visit to St. Petersburg.